Although I had lived in Taiwan for almost a year and a half and spent some time learning at least a beginning level of Mandarin Chinese I was intimidated by the thought of setting some piece of the second book of the Red Slaves series in China. As it turned out, that location wasn’t so much what I ended up needing to research. Instead, I found myself digging further into Chinese mythology. 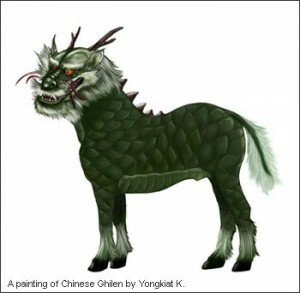 One of the creatures I discovered was the ghilen–a creature that represents the five Chinese elements, fire, earth, metal, water, and wood. Its constituent parts are the head of a dragon, the body of a deer, covered with scales, the tail of an ox, and horse-like hooves. In my touristy travels through Taiwan, Hong Kong, and Macau, I’d noticed the fantastical carvings ubiquitous on the temples and older buildings. Certainly watching the dragon-boat festival in Hong Kong and seeing the various parades with Chinese dancers emulating dragons, I knew that culture had a significant fascination with those creatures. I hadn’t known they’d created other creatures based in part on them. Or that they have their own, significant mythology and lore. It was some fascinating reading–and netted me an ambiguous counter for Anne and her team to come to terms with.